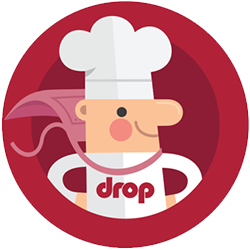 Drop — How do I transfer ingredients to another container? You may have noticed how easy it is to add ingredients into a container and mix them together. But how do you transfer them out of their original container? Even though this is only one action step, it is a bit more complex than others, and requires a little more thought. Here&apos;s how to do it. 1. Start by naming the container you want to transfer. Click on the container in the Containers section of the sidebar. 2. A modal appears. Click Edit. Name your container after its contents. For example, if it&apos;s a bowl containing cookie dough, name it "cookie dough", then click Confirm. 3. This will bring you back to the Method screen. You&apos;ll notice that your container name is updated. 4. Now, select your container from the Containers section of the sidebar again. 5. A modal appears. Click Transfer. Where do you want to put the contents? Choose or create a destination container, and click Confirm. These actions will create the step "Transfer [container 1] to [container 2]." If you&apos;d like to modify this sentence, you can edit the name of the action by clicking Edit on the action card. For example, by changing Do What? from "Transfer" to "Scoop" and pressing Confirm, you can create the sentence "Scoop cookie dough onto baking sheet."